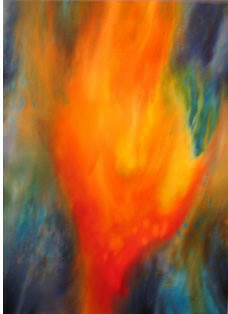 There will be a Gallery Reception on Saturday, October 16, 2004 at 11:00 a.m. All are welcome. Decorah native Robyn Sand Anderson graduated from Luther College in 1979. She studied keylining & design at the University of Minnesota in 1981, and has completed several professional watercolor workshops with national and international masters in that medium, including George Bevill, Tony Couch, Cheng Kee Chee, and Catherine Wilson Smith. Anderson has taught high school art in Central City (IA) and New Ulm (MN), and in 2001 she opened Sand Studio/School of Art & Design in New Ulm to teach artists of all ages. She has been commissioned to create works for several individuals and a variety of organizations, many of which reflect her interest in the intersections of art and faith. In 2004 a commission for one of her paintings was auctioned at the Winneshiek County Hospital's Crystal Ball. Her work has been included in several exhibits, most recently earning the People's Choice Award at the Brown County Annual Juried Art Show. Anderson has been the recipient of numerous grants from the Prairie Lakes Regional Arts Council and the McKnight Foundation for pursuit of her work. "One of life's greatest gifts is to discover the gifts God has given you and have the opportunity to use them. Becoming an artist has been a slowly unfolding dream. When I paint a watercolor it is like unraveling a puzzle, like reading a great mystery novel - I can't wait to get to the end and find out how it all comes together. 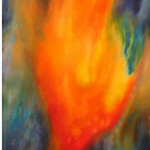 The challenge is to bring all the parts, color and shape together to pull the viewer in and capture their imaginations. I hope to enhance the human experience by use of color and design, to draw the viewer's attention to all that is around us ... what we consider the ordinary. I have always taken delight in noticing beautiful color and shape in the environment around me. Growing up in Decorah gave me constant natural beauty. I paint many different subjects, but what intrigues me the most is capturing ordinary human moments. I hope to concentrate on those moments in my future work."